Tiger-striped green and maroon petals surrounding yoke-shaped bluish violet lips make this orchid the center of attention in any room. 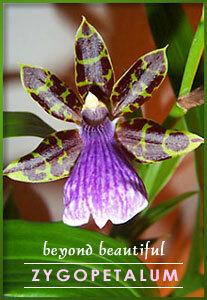 The large blooms of the Zygopetalum are incredibly fragrant and can infuse an entire room with their aroma. Place one next to your bedside for a pleasant, aromatic greeting each morning. The flowers will remain in bloom for approximately 4-6 weeks. Click Image For More Details. Saturday, place your order by noon PST.